The Nokia 808 PureView and its 41MP monstrosity are expected to hit the stores this May. 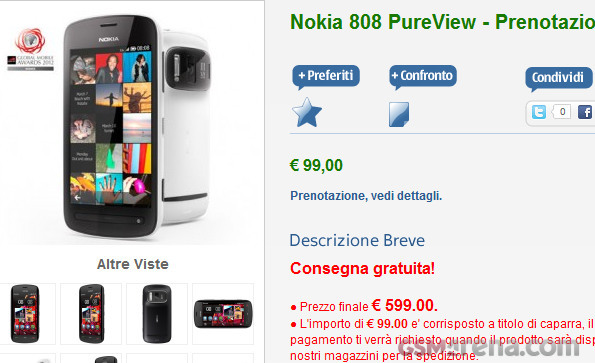 With the release date closing in, Nokia Italy has started their pre-order campaign for the PureView. The cameraphone costs €600 while €99 of those you must pay now to reserve your unit. We assume that other Nokia stores will soon launch their pre-orders as well. You can check the 808 PureView announcement here, our specs page and some camera samples here, here, here and here. Thanks to Ronnie for the tip!